Windows Task Manager is a task manager application which comes with the Microsoft Windows NT family’s operating systems. 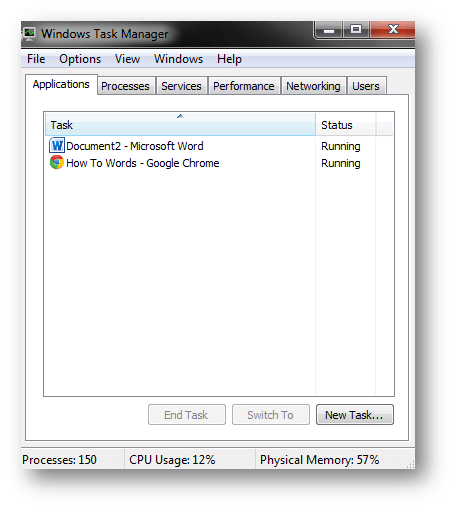 Windows Task Manager provides detailed information about running applications on computer, current processes and computer performance along with CPU usage; it will also provide information of commit charge and memory information, network activity and statistics, logged-in users, and system services. The Task Manager can also be used to set process priorities, processor affinity, forcibly terminate processes, and shut down, restart, hibernate or log off from Windows. The task list was capable of listing currently running processes and killing them, or creating a new process. In Windows XP only, a Shutdown menu is also present that allows access to Standby, Hibernate, Turn off, Restart, Log Off and Switch User. Click Run and type following command. Task manager will be disable.